postpartum belly wrap belt,postpartum belt are more features, more comfortable. Strengthen 3 In 1 Postpartum girdle? 3 in 1 postpartum belt is made of the best elastic material and is very breathable. If you are just having a baby, it is best to choose a 3 in 1 postpartum belt,postpartum belly band because it works best. hot sale postpartum girdle online,All postpartum belt can offer free shipping and 100% easy return. Why Choose SimaSlim Postpartum girdle? Welcome to SimaSlim postpartum girdle shop. Our postpartum belly wrap belt,postpartum belly band focus on considering two situations including a natural birth and cesarean section. Normally, our postpartum support belt especially professional design make our postpartum belt suitable for a natural birth and cesarean section. You will feel very comfortable and when wearing our postpartum shapewear and at the same time it will be very good for protecting the abdominal organs and so on for the puerpera. Recommend postpartum girdle c section online, 100 satisfaction guarantee and 100% money back guarantee.
" Currently, 3 weeks postpartum and I've been wearing for 2 weeks during the day and have noticed a difference in my waist line. I really like that it sits high on the back. 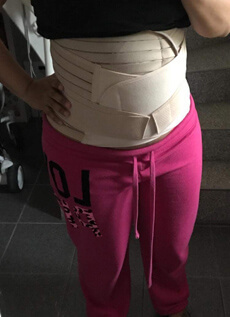 No rolling and postpartum corset helps tremendously with posture. Thanks!" " I wear all 3 all the time I wear it and usually for about 7 hours each day. It's Been one month since I had my twins and my belly is almost back to normal because of this girdle. I'd recommend this postpartum belly band! " " I bought post-baby girdle as a gift and have gotten good feedback, namely that it fits as expected, has a good even flesh tone. The material is pretty soft, and it seems pretty sturdy. A good idea to stock up on these as gifts for expecting friends. " 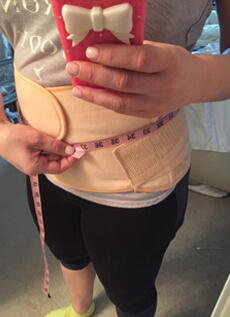 " I'm 6 weeks postpartum and these waist wraps are really helpful. Not only do they tighten everything, they also provide much needed back support. It does take a while to get used to, I like that there are 3 separate pieces allowing me to mix and match them. The velcro is strong and it doesn't come off once it's on. " It is most possibly to cause abdominal deformation because of overstretch for postpartum women in childbirth, resulting in flabby abdomen, loose muscle, and uterus not recovering in time for 100% of postpartum women, meanwhile leading to fat accumulation and many gynecologic disease. In this case, it is the main cause to affect appearance, postpartum differences in body shape and many diseases. It will also result in serious consequences and impact on pregnancy next time if not be protected well women abdomen after giving birth. We should always pay attention to the abdominal status and consult the doctor if any illness after childbirth. In the normal situation, the doctor will advise the maternal to take much care of their abdomen to avoid any damage after childbirth. And the best way to protect the abdomen is to wear the postpartum belt c section, postpartum belly band after c section, postpartum compression band girdle,post natal belt ,postnatal girdle. The high-quality postpartum girdle after pregnancy has the good effect on protecting the abdomen. And this functional compression postpartum girdle belt could not only be good to narrow postpartum abdomen, uterus, and ureter, and relieve abdominal pain but also good effect with the use of bdominal belt after delivery. You should use the postpartum girdle c section to protect yourselves well. So it is necessary for you to choose a high-quality postpartum belly wrap and postpartum recovery belt. Different postpartum belly band could be causing the different effect. The postpartum belly wrap band could help you fix your abdomen to avoid your internal organ prolapse so that prevent damage to organ, and also achieve a body shape when wearing postpartum belly belt. Thereby, it is so important to wear suitable post pregnancy girdle after giving birth. For 8 years, our company has been committed to the development of the latest and most comfortable postpartum girdle, girdle for stomach. And now, we have more than 500 employees, has received dozens of postpartum belly wrap hand patents, at the same time, our company currently has 10 postpartum belt, after delivery belt brands. And we can offer free &fastest shipping for each postpartum belly hand wrap and postpartum support belt order, 7x24 hours service online, 100% Money Back Guarantee.